This 1940's style pinup of Hawkgirl is part of a part of the DC Comics "Bombshell" collection by Ant Lucia. You can check out the others in the series right here. The entire ten image series is being released as art prints by Quantum Mechanix at a price of $14.95 apiece. I had seen the Wonder Woman of these before, but the others, including Hawkgirl, are new to me. I would have figured that being of a 1940's art deco style, the subject would have been Shiera Saunders, between the helmet design and the colors on her costume, it's clear that this is Shayera. 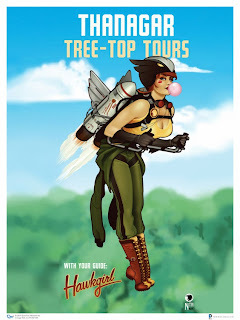 Then again, the fact that it is Thanagar Tree-Top Tours should have also been a dead giveaway, but hey. My favorite part of the piece is the posing, specifically the legs. Very much in the "good girl" sort of pose which was common for pin-ups. Legs together, toes pointed, tush sticking out (although covered with her jacket), it all works very nicely. I also like that her arms are toned but not muscular, and her chest is ample without being ridiculous or over-the-top. The helmet is a nice take on her swoopy Silver Age helmet, with the colors reminding me a bit of the Nicola Scott designed Earth-2 Kendra Saunders helmet. The aviator goggles hanging around her neck similarly call back to this. The jetpack/wing harness is very amusing. I like the WW2 style artwork on the side, designating it as "The Hammer," along with her morningstar mace and 5 tick marks, which I can only assume are her "kill" count. Overall a very striking piece, which would look perfect hanging up in my bonus room amongst all the other nerd wall hangings. 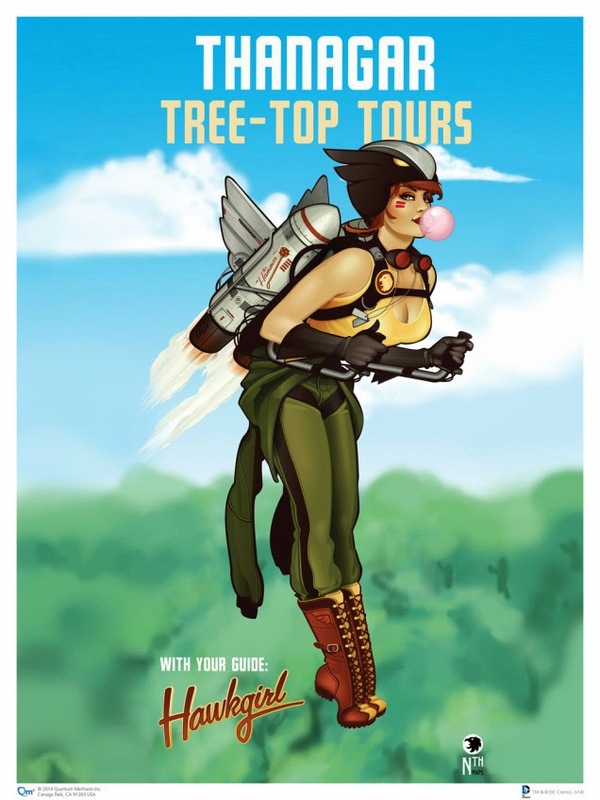 Image: Hawkgirl "Bombshell" Art Print, 2014, Ant Lucia.